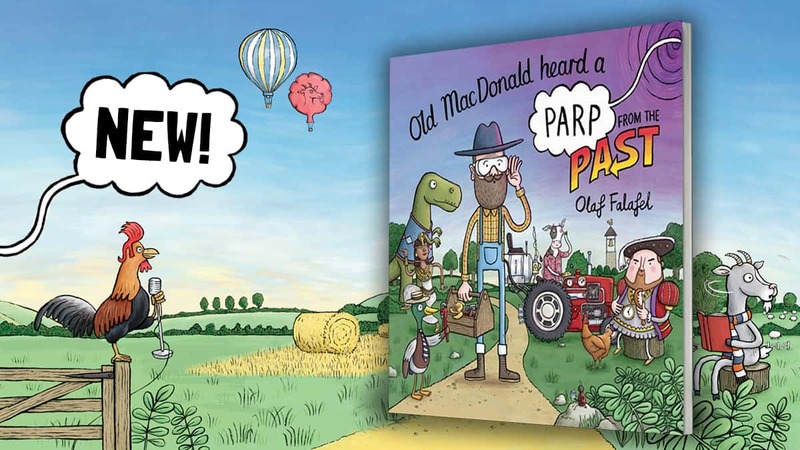 Head back in time and hear parps from history with Olaf Falafal’s new book, Old MacDonald Heard a Parp from the Past! Old MacDonald heard a parp... E-I-E-I-O! Old MacDonald is back in his most hilarious adventure yet! Our friendly farmer is going back in time on a parp-powered journey through the fart-filled past. Join him in rhyme as he meets dinosaurs, Vikings and queens, and laugh out loud as they parp their way through history in the third book from Olaf Falafel! This book is perfect for you if you loved past Olaf Falafel books, like Old MacDonald Heard a Parp and Father Christmas Heard a Parp, or if you’re a fan of the Dinosaur That Pooped series!